Don’t you just love beyond border foods ? They have a way of popping up when you least expect it. You really aren’t in the area or country that they are originally from, but due to some quirk of history, they manage to find their way across borders and demarcations. A classic example is the delicious chickpea flour pancake called farinata. Like all border foods, the farinata goes by different names, depending on where you are standing when you bite into its yummy goodness. In Italy, the land of its birth, it is called “farinata” – made of flour – on its home turf of Genoa in Liguria. Which mutates into “la fainé genovese” in Sardinia. Across the border, in Nice and the French Riviera, it becomes the punchy “socca”. Even within Italy, it changes nomenclature to the “cecina” – made of chickpeas – in Tuscany, and in and around Pisa, the name leans to the more formal “torta di Ceci” – chickpea pie. 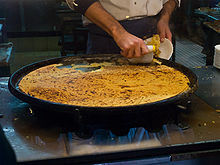 In Savona, it becomes the “farinata bianca” made with wheat flour instead of chickpea flour. In Livorno, they call it a “cinque e cinque” – five plus five, a throwback to the time the pancake and the focaccia bread it was wrapped in cost 5 lira each. And it Piedmont, its a naughty “belecauda” – “nice and hot”. Further afield, the Algerian “karantita“ spices it up with harissa and cumin. 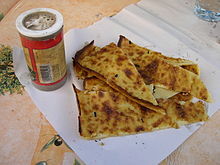 Variations called “faina”, eaten “a caballo” – on top of pizza, have been found as far south as Argentina and Chile, the recipe forming part of the carry on luggage of migrating Ligurians in the 19th and early 20th centuries. Gibraltar has made their version called “calentita” – baked and “panissa” – fried, their national dishes. In my very own India, it makes it appearance as “cheela”, with Indian spices providing their own unique twist. All this truly elevates the farinata to quintessential beyond border food. If that isn’t legendary enough, there’s more. Time travel to the 13th century., the year 1264 to be exact. Pisa and Genoa are at each other’s throats, trying to be top dog over trade in the Mediterranean. At the battle of Meloria, Genoa gives Pisa a royal thumping, and in time honoured tradition, rounds up boatloads of Pisan prisoners. On the voyage home, they are beset by, what else, a huge thunderstorm. All the cargo and loot that has been lashed carefully on board comes loose, chief among which are huge quantities of chickpea flour and olive oil. The centrifuge that is the storm blends these two together, along with generous helpings of salt water, better than any Cuisinart ever could, and a thick batter emerges. The Genoans, long famed for their miserly disposition, are loath to chuck the mess overboard, and decide it would be put to better use as food for the Pisan POWs. As honourable prisoners go, the Pisans flatly refuse, and the batter lies there on the deck, with no takers, for a whole day, baking in the sun. Now everyone wants to peel off a strip, and the wily Genoese, knowing they have a good thing on their hands, literally, perfect the recipe once they are back on dry land, and call it “L’Oro di Pisa” – Pisan gold, in mockery of their stubborn Pisan prisoners. Then, being good merchants and all, they take their new invention and spread it far and wide around the Mediterranean region. Traditionally, the farinata is cut into irregular pieces and eaten with the hands, often with black pepper, else wrapped with focaccia as a redolent sandwich filled with hot goodness in every bite. Its very simplicity allows numerous variations – add onions for their sweet pungency or rosemary for its rich flavour. It’s easy to treat it like a chickpea pizza, and add interesting toppings like cheese or mushrooms, sausages or tomatoes. Or add things into the batter itself – raisins, spinach, olives… endless possibilities abound. Even changing the oil used results in a completely different flavour. Puritans will insist on a copper pan and a traditional wood burning oven to bring out the best in the dish. But that’s the beauty of beyond border foods. You have a few common ingredients, and a general idea, and after that, local flavors and creativity take over. Versatility is king. There are no rules. There is no one way. All there is, is an irresistible meal, good enough to call one’s own.